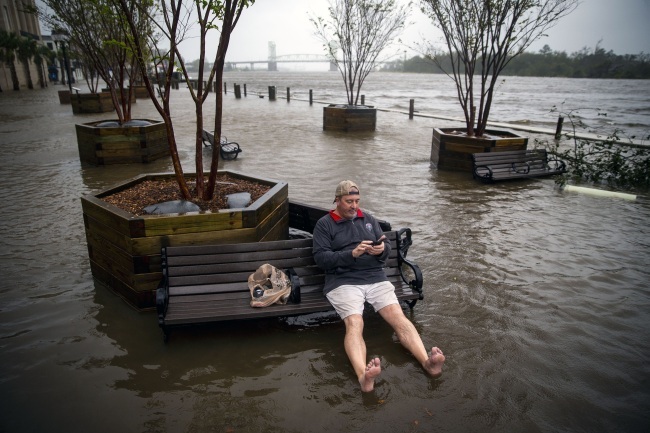 WASHINGTON (AP) -- A warmer world makes for nastier hurricanes. Scientists say they are wetter, possess more energy and intensify faster. “Florence is yet another poster child for the human-supercharged storms that are becoming more common and destructive as the planet warms,” said Jonathan Overpeck, dean of the environment school at University of Michigan. He said the risk extends beyond the Atlantic Ocean, such as Typhoon Mangkhut, which hit the Philippines on Friday. “I think we can say that the storm is stronger, wetter and more impactful from a coastal flooding standpoint than it would have been BECAUSE of human-caused warming,” Pennsylvania State University climate scientist Michael Mann wrote in an email. “We have solid data across decades of rainfall records to nail the attribution -- climate change is increasing the frequency of extreme rainfall events,” Cobb said. And to look at Florence specifically, “it’s very likely that climate change has warmed the ocean such that the hurricane‘s intense rainfall is more destructive than without global warming,’‘ said Weather Underground Meteorology Director Jeff Masters, a former hurricane hunter. Several studies agree that climate change is to blame but differ slightly in their conclusions. With the emergence of Florence, some place in the US has been drenched because of a stalled hurricane for four years in a row, storm surge expert Hal Needham said.